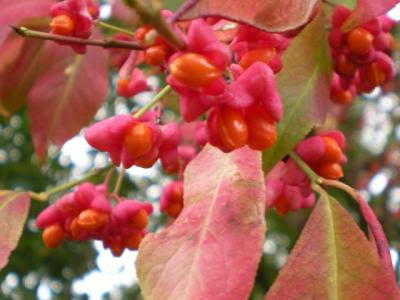 It’s called a spindle tree and it has really unique fall colors. I’m so thankful right now for all your support. I wouldn’t be where I am today without all of you. You rock! Olivia Waite did a post about how thankful she was for readers that about sums up how I feel. 12/14/11: This contest is now closed. The winner is rudi_bee. Congratulations! I’m going to start running my contests from my blog, because it will make admin a lot simpler for me and hopefully lead to actual monthly giveaways–the signed books are piling up on my shelves! Just comment on this post to enter, and make sure you enter your e-mail address–it shouldn’t show up to other commenters, but I’ll get it and then I can easily notify you of your win. As always, if you want to be alerted when a new contest goes up, I recommend signing up for my newsletter. This month I’m giving away a signed copy of Courtney Milan’s Unveiled . Margaret had always thought a man seduced a woman by making her aware of his charms: his body, his wealth, his kisses. How naïve she’d been. You can read my five-star reviews of both Unveiled and Unclaimed on Goodreads if you want to know more about my deep and abiding love for these books and/or see other readers’ reviews. Comment for a chance at winning! Author Rose LernerPosted on November 7, 2011 Categories contest18 Comments on New contest!